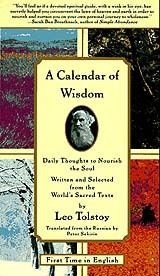 Book review: "A Calendar of Wisdom: Daily Thoughts to Nourish the Soul"
This review first appeared in the American Reporter in December 1998. This first English translation of Tolstoy's last major work was first published a year ago, but not received for review until after the new year  and as it is a calendar, discretion dictated we review it now, when it is mostly likely to be purchased and read. Leo Tolstoy was a firm believer that you are what you read, and to that end the last decade of his life was spent collecting small pearls of wisdom from both sacred texts and his favorite secular writers. He then arranged these aphorisms thematically, added a bunch of his own, and laid them out as inspirational reading over the course of a year. He expanded the book through each of three editions  the English translation is taken from the third edition, published in1908, just two years before Tolstoy's death. Each day of the year (including Feb. 29 for leap years) has four to eight short inspirational passages intended, Tolstoy wrote in his introduction, to help the reader "experience the same benevolent and elevating feeling which I have experienced when I was working on its creation." The sources for the passages range from the Bible and Talmud to Americans Ralph Waldo Emerson and Henry David Thoreau, Seneca and Epictetus from ancient Rome, Confucius and Lao-Tzu from Imperial China, Western philosophers Schopenhauer and Voltaire, to the prophet Mohammed. As reflected in this book, Tolstoy's ethos was, if not traditionally religious, certainly traditionally moral: Don't hurt others. Don't lie, cheat or steal. If you do screw up, admit it, learn from it, and move on. Follow the advice here, and you should have a pretty good shot at keeping most of your resolutions for the new year.